Serene environment for healing and growth. Costa Colina believes each patient is defined by their memories, personality, goals and relationships, believing the power to heal is not exclusive to some, but possible for everyone. Costa Colina strives to help clients find their balance, flexibility and resilience; the major pieces of recovery. 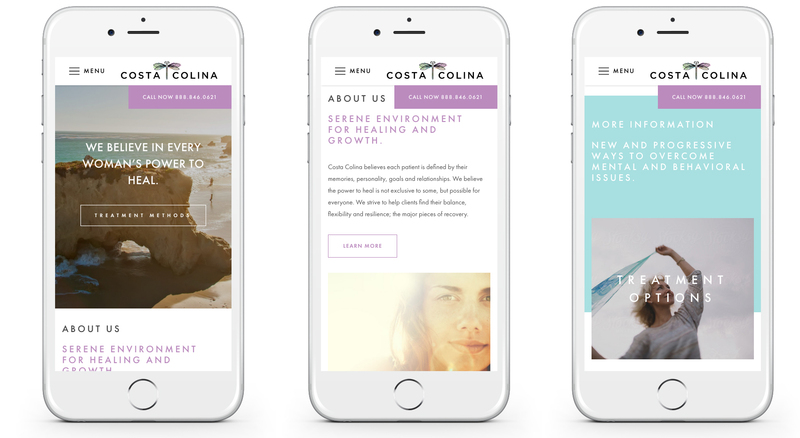 We were hired to create online presence for Costa Colina, an all female treatment center. The project required a full revamp of the brand and its platforms as well as a creation and execution of social media. We were tasked with creating a universe of information and visuals so that prospective clients could feel as if they were touring the facility and meeting the staff. This site, like all of our sites is custom coded from top to bottom and mobile responsive, with a back end that is easy to use, edit and update. The site includes a blog, various sign up forms, calls to action, social media integration, and is fully search engine optimized. The website was built with WordPress allowing the Costa Colina team to easily manage all website content. We crafted exciting designs with a lovely feel to match Costa Colina’s vision and accommodations. We designed the website with a mobile first approach which resulted in it being optimized across devices of any size, while still keeping Costa Colina brand vision in captivating way.